Hi friends, I am busy for my study so I have been late to updated post. 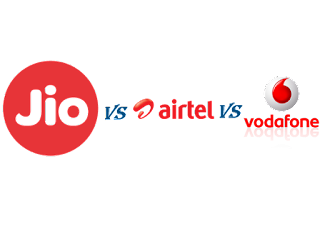 Nowadays Jio, Airtel, Vodafone(Vodafone+idea marge so recent) are the main mobile operator in India. Everyone try to provided it's best plan in India's own customers. In this time Airtel is no. 1 for customer base, Vodafone is no. 2 and Jio is no. 3 position. Now you know the battle of its 4G internet speed and free calls, SMS and also much more like Music, TV, Movies etc. **The data speed is reduced to 64 Kbps after the usage of daily limit.